Five generations of the Farthofer family have dedicated themselves to crafting high quality organic spirits. Located in Austria, the Farthofer distillery has now ascended to be recognized as a World-class producer of spirits and liquers. That is especially so after the success of their various organic products which achieved tremendous success in international competitions. The current head of this family operation, Josef V. Farthofer, claims the secret is in the quality of the water they use, the fact that they don't need to filter the distillate because of the water quality. 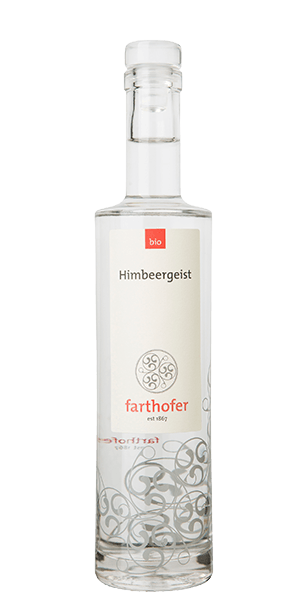 Farthofer Himbeergeist is a Brandy made exclusively from Raspberries that are sourced from local farmers that have certified controlled organic agricultural areas. The main effort goes into making this Brandy as organic as the fruits used for it’s production, the Brandy is not aged and delivers a true spirit from Raspberries! What does Farthofer Himbeergeist taste like? The Flavor Spiral™ shows the most common flavors that you'll taste in Farthofer Himbeergeist and gives you a chance to have a taste of it before actually tasting it. Fine and spicy rose note with some green tea and of course Raspberries. Powerful and long finish with an overwhelming sensation of Raspberry puree. Raspberry, Spicy, Green Tea, Raspberry puree, Fresh, Fruity, Berries. Creamy and mild. Very little spice. Would be nice paired with raw fruit.